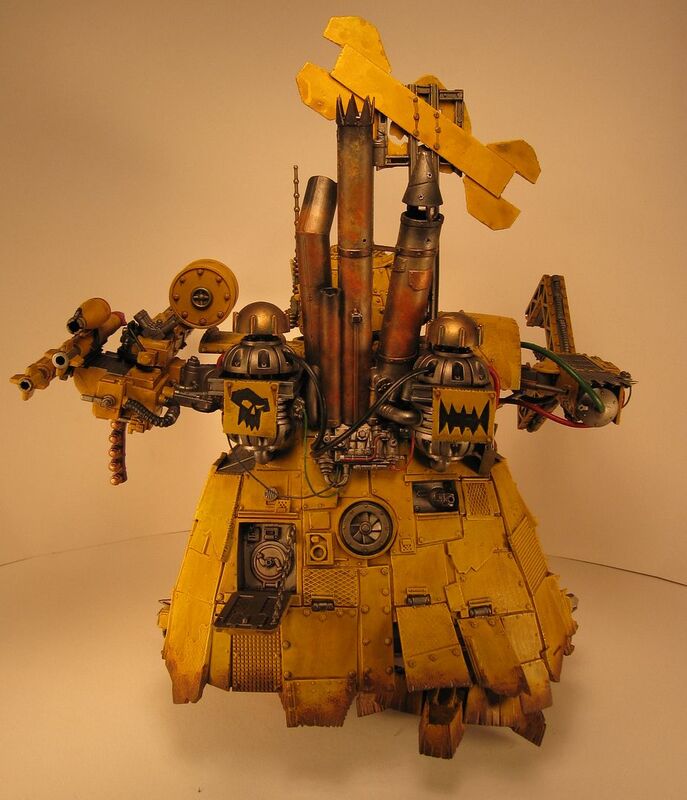 Last day of the month and I have I just finished my 40KFC 2010 Painting Challenge project for June, a Bad Moonz Big Mek Stompa. I like the way it turned out. I probably could have just kept painting the little details until the end of time, but I am just going to have to call it done. This also completes my #3 Painting Resolution for 2010. After reading this post on Dark Future Gaming's blog, I tried the weathing technique using foam, only I used it for painting the mud on the feet and around the base of the skirt on the Stompa. I like this technique, especially on such a large model. It was quick but I am going to need more practice on getting just the right amount of paint on the foam, that seems be to the trickiest part. 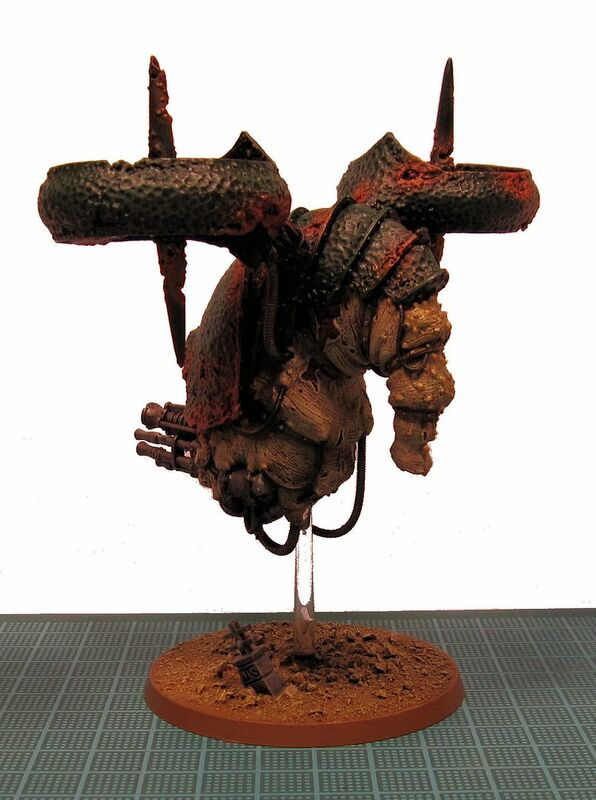 For painting this mud, I used Scorched Brown followed by Bestial Brown. It gives it a nice 'not quite dried mud' look. I will definately be using this in technique in the future. Next month's painting challenge project, Shoota/Spanna Boyz. 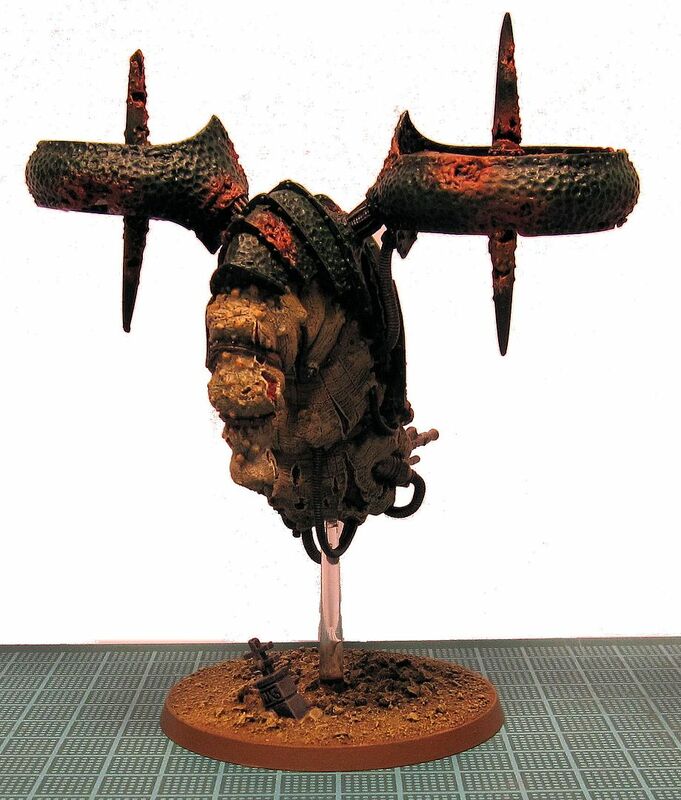 Note - After the problems I had taking good quality pictures of my Nurgle Blight Drone, I have spent some time researching photo tips for miniatures as well as Photo Boxes. Instead of using two lights, I added a third one. I put two level with the table pointed slightly up and a third one pointing down. In the future, I want to get a fourth light and have two lights point slightly down at an angle. I have also tinkered with the settings of my camera. These photos I took of the BMS are unedited and I think they turned out good, but there is probably room for improvement. What do you think? 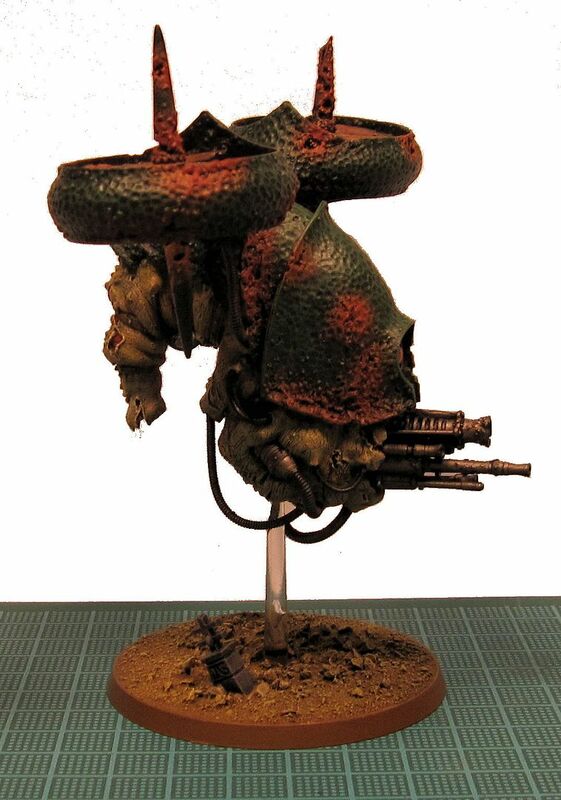 In addition to painting my Big Mek Stompa (which is almost done, just have some fine detail to finish up), I have been working on painting my new Blight Drone. The model itself is mostly painted, but I have yet to do anything with the base. I want to do something special with the base, but I am not sure what at this point. I like the way it has turned out so far, but unfortunately the photos do not do it justice. For some reason, every picture I take of it gets that strange pink tint to the background. I am not sure what is up with that. I have tried different lighting and everything else I could think of. Photoshop only makes it worse. Before getting to the Dread Mob list, I wanted to mention that this is my 100th post here at the War Room! 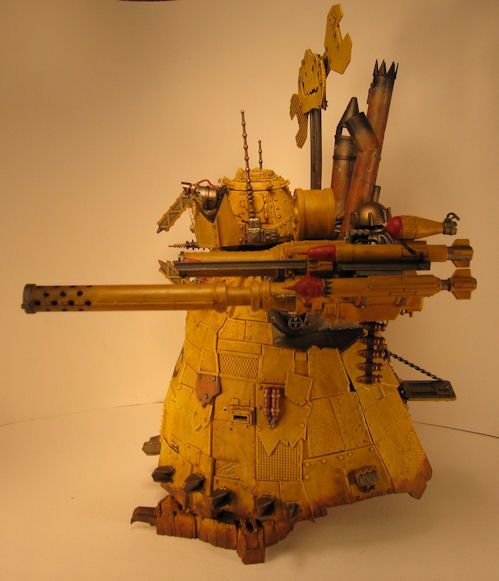 Originally, this blog started out as a Chaos Daemon blog (hence the URL wh40kdaemons.blogspot.com). At that time, I was participating in a Tale of Four Gamers with my new Chaos Daemon army and I wanted to chronicle my progress as we went. 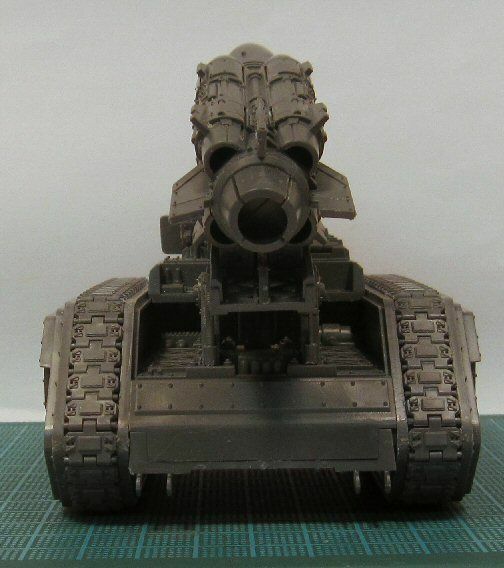 However, it quickly evolved into a general war gaming blog as Orks took center stage with all the new releases that have come out for them in the past year. Writing has never been one of my strong suits, but I have really enjoyed blogging about all my projects, games, leagues, and whatnot. I hope you have enjoyed reading about them. I am roughly three months away from my one year anniversary and I am trying to think of something special to do to celebrate it, so stay tuned. As I mentioned, this was my first time playing a Dread Mob list and I would have prefered to try it out on one of the normal 40k missions first instead of a Planetstrike game. 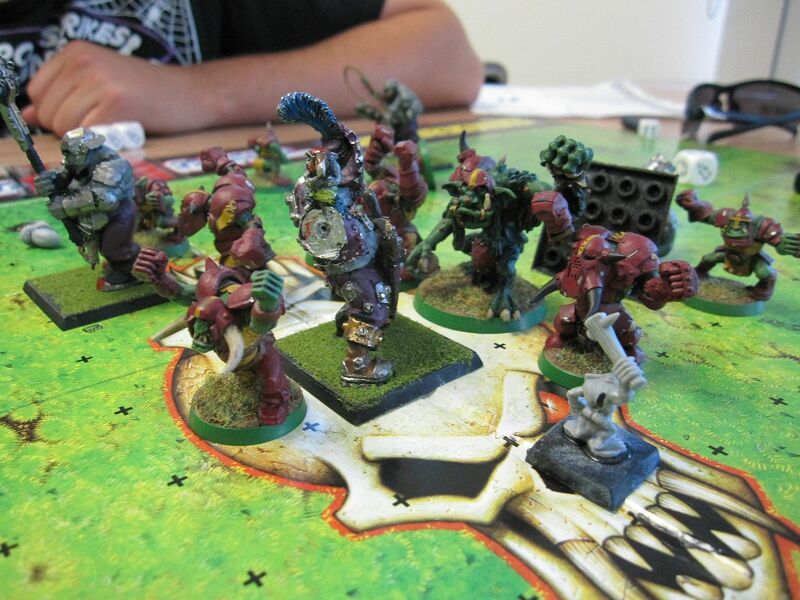 Prior to playing the list, I had heard from others who had played it that you cannot play it the same way as a normal Ork army and that it should be a 'shootier' army. I definitely saw this. So let’s get into the units in this army. I will try to only discuss the units I used in this game. 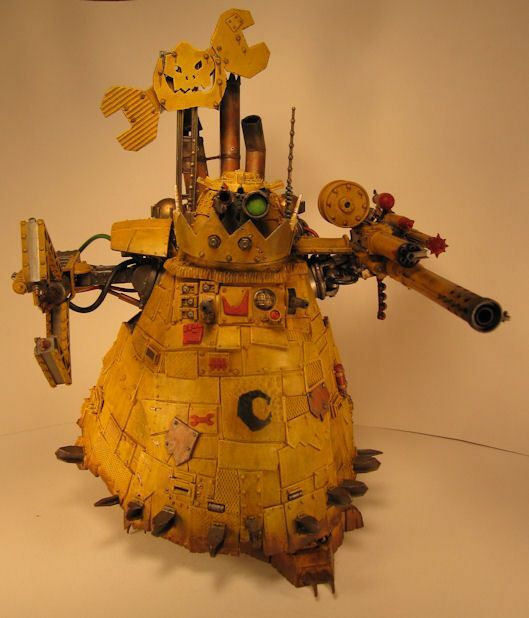 Big Mek (HQ): Same as in Codex: Orks. 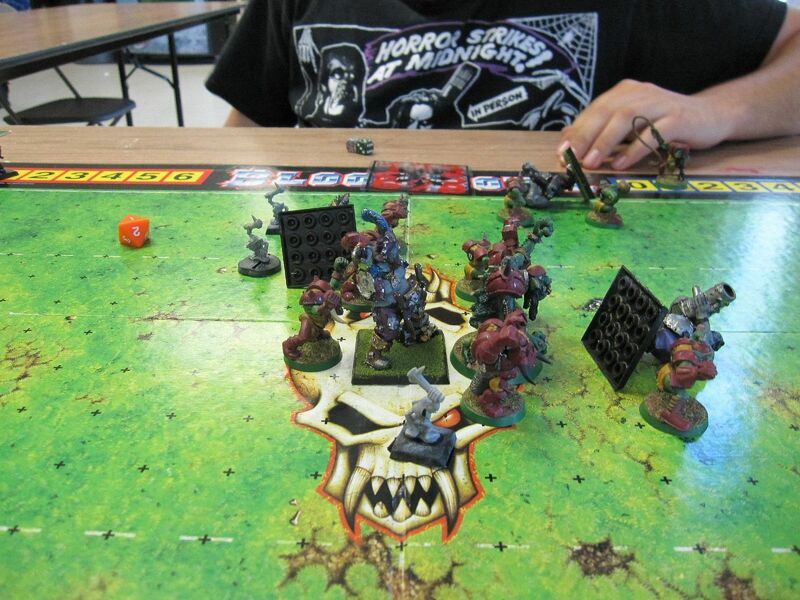 Cybork Slasha Mob (Elite): These are practically Cybork Nobz led by a Painboy. This unit is expensive coming in at 170 points for 1 Painboy and 4 Cybork Slashas, and you can add more cybork slashas (+30 points each) up to a total of 10 models. However, with 2 wounds, a 5+ invulnerable save, and FNP, they might be worth it. You can give them Heavy Armor for +5 points/model and your may equip as many of them with Power Klaws (+25 points each) as you want, but that will jack up the points fast. You can also mix in Big Choppas, Combi-Shootas, and TL Shootas. In the game I played, they were stuck in reserve inside the Lifta Wagon until late in the game, so they never got to see combat. Probably best to put them in a transport to protect them until they can assault the enemy. 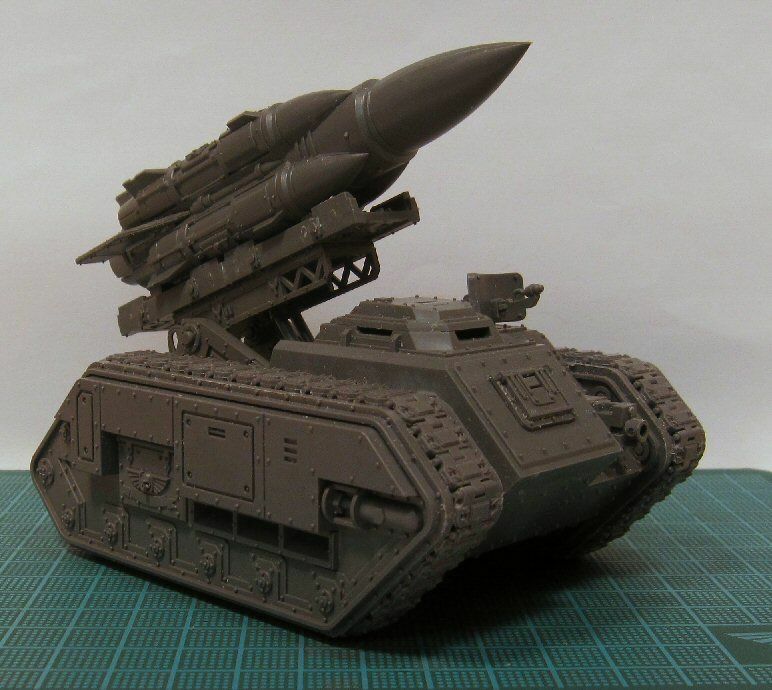 Burna Boyz (Elite): These are the same as in Codex: Orks except that they have the option to take a Scrap Trukk (see below). This is a good option IMO and makes them more attractive. 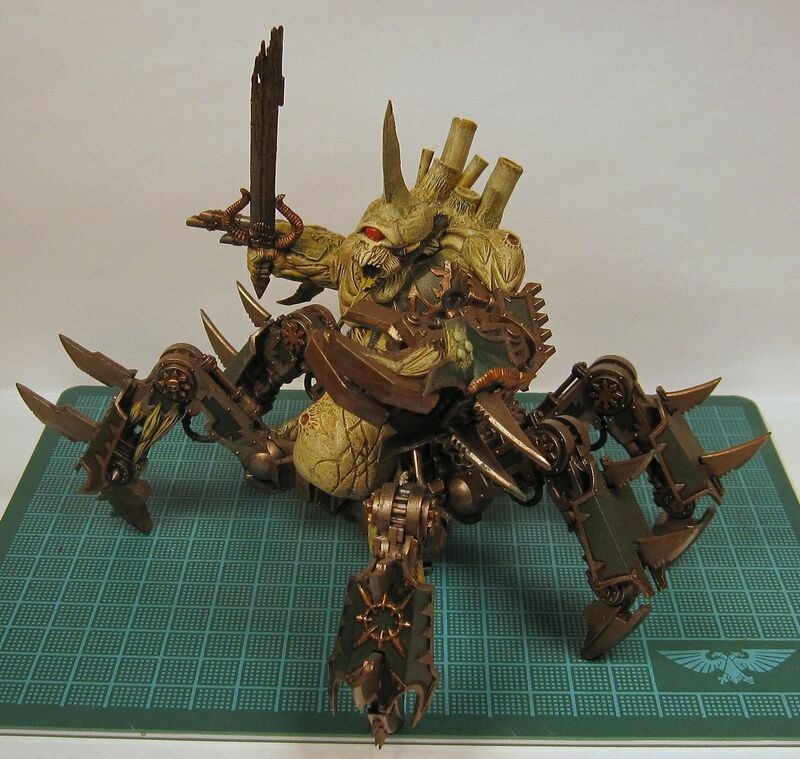 Scrap Trukk (Dedicated Transport): This is an Ork trukk that is not Fast, but comes with Armour Plates and a Grabba Klaw, for the same 35 points. 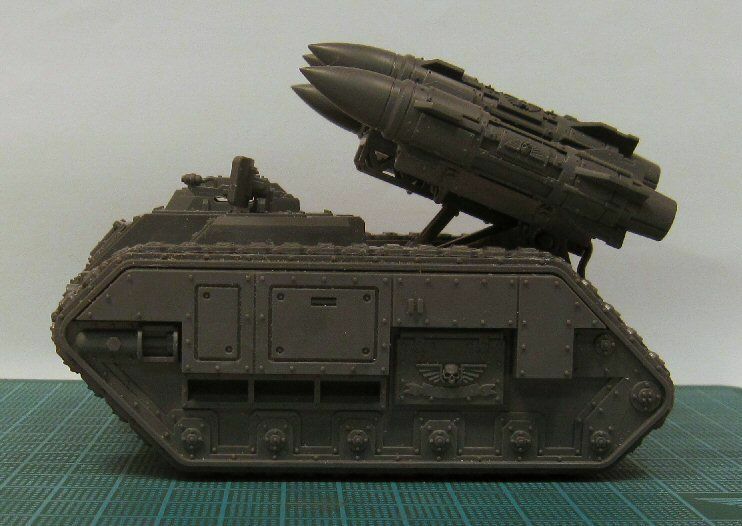 Hard to say if this is better than a normal Ork Trukk or not, only time will tell. Fast is definately missed. Junka (Elite): This is an odd vehicle in my opinion. 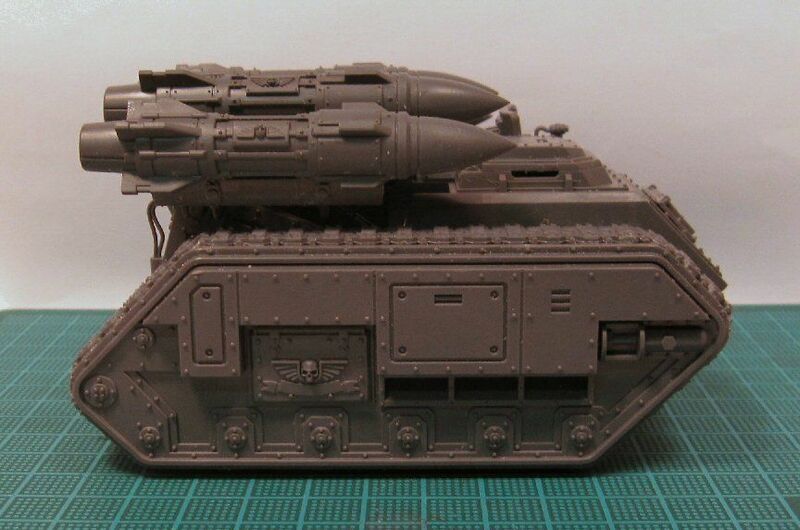 It is basically a SM Rhino, but it can have some nice upgrades. First, you must give it one of the following and is included in the cost: Deff Rolla, Grabbin' Klaw, Reinforced Ram, Wreckin' ball. I am not sure why you would ever not take a Deff Rolla, but that is me. 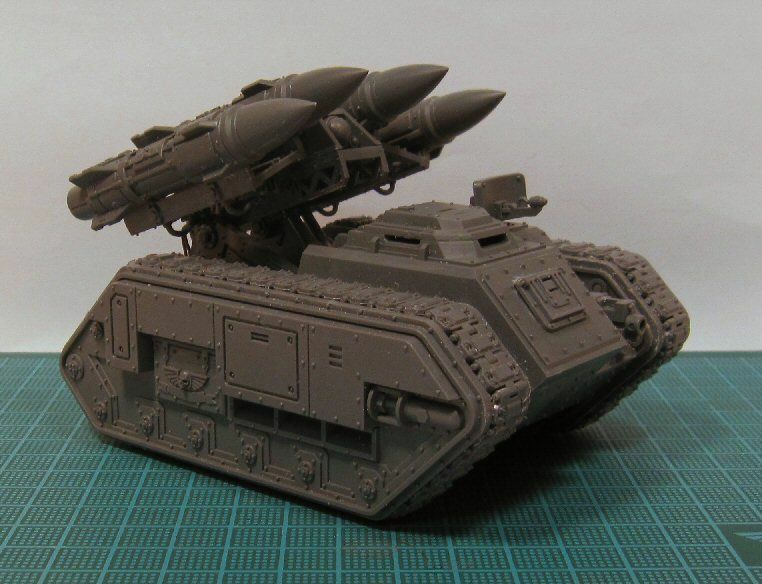 You may also add one of the following: Kustom Force Field, turret mounted Big ZZappa, turret mounted Shokk Attack gun, turret mounted Supa-Scorcha, or up to 2 Grot Bommz. If you do take any of those, it reduces the transport capacity from 10 to 6. I have heard of people taking the SAG and Deff Rolla combo where the SAG rolls the Teleport option which teleports the vehicle (and occupants) into the target unit, thus setting off the deff rolla effects. Seems like a potentially potent combo. I tried for this combo in this game, but did not get it to go off. With only an armor of 11, it survived much longer into the game than I expected, but I think that was only because there were many other targets that were higher priority. Spanna Boyz (Troop, 1+): This is the core unit of the Dread Mob list and you must take at least one unit in each army. It is a Boyz mob that can be armed with either Sluggas & Choppas or Shootas, but it has some disadvantages over normal Boyz Mobz. First, you are limited to a max unit size of 20, not a significant disadvantage, but your mobz are slightly more fragile. Second, you cannot upgrade any boyz with special weapons. This one I do not get at all, but it would seem that the special weapons are reserved for the Mek. 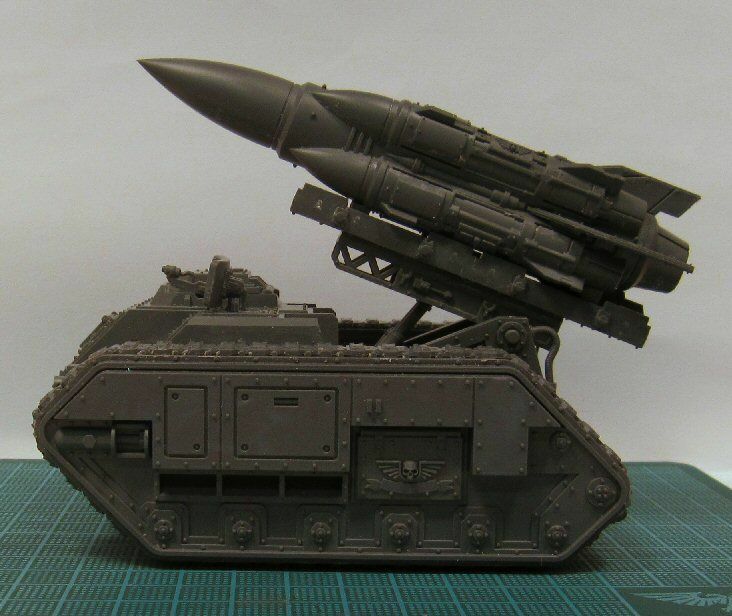 Third, you cannot give the unit a Nob, instead you can give it a Mek. 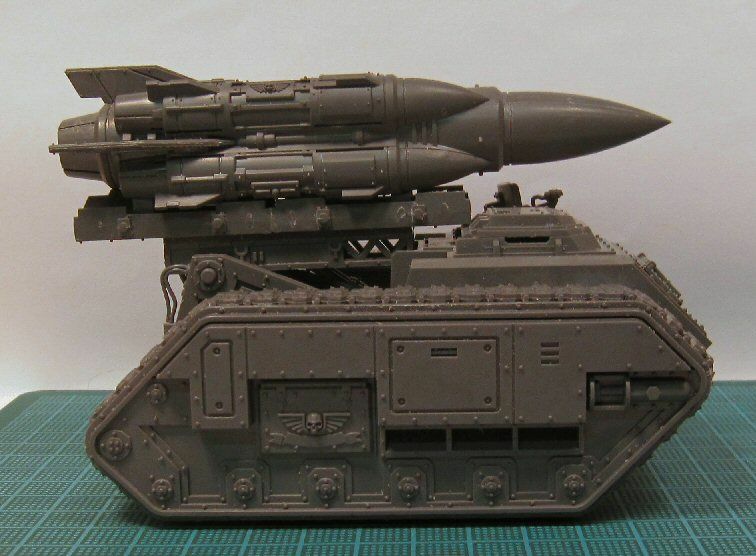 Significantly, the Mek cannot be armed with a Power Klaw. You can equip him with either a Burna, Big Shoota, Rokkit Launcha, or Kustom Mega-Blasta. 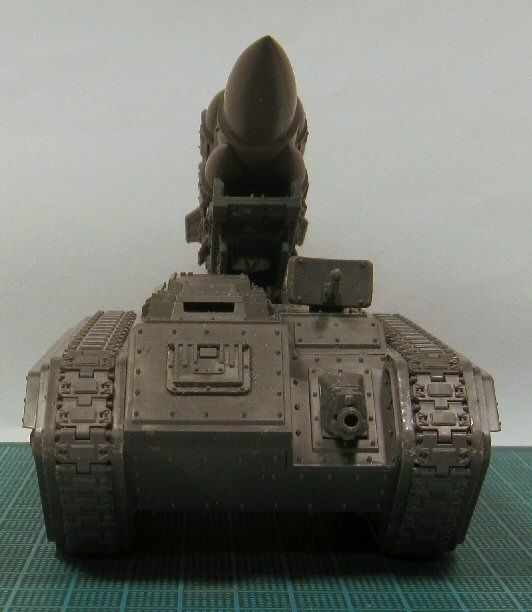 Given that you cannot have a power klaw hidden inside this unit, I think Shootas are the weapon of choice. 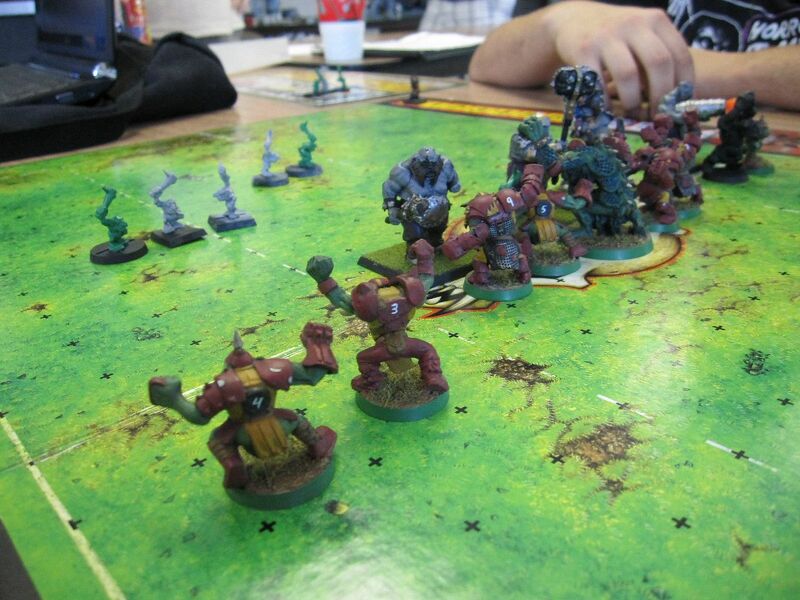 Gretchin Scavenger Mob (Troop): This is nothing more than a normal unit of Gretchin with Firebombz. Firebombz count as Assault and Defensive Grenades, but every time the effect comes into play, you lose D3 grots. 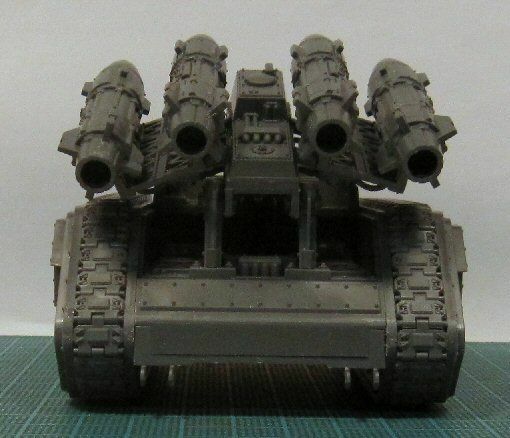 You can have max 30 grots and 3 Runtherders. To be honest, this unit was the best performing unit in this game. 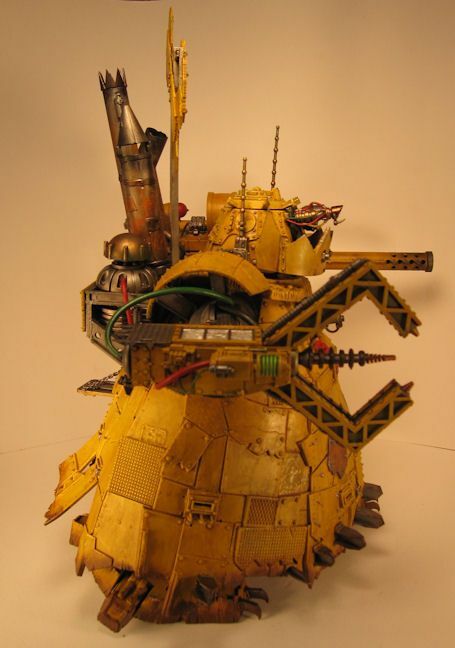 Deff Dread Mob (Troop): Deff Dreads in this list can be taken in units of up to three. Unfortunately, these dreads are a base 85 points instead of 75 points. Those extra points in my opinion are a killer. The Vehicle Squadron rules for this unit worked both in my favor and against me. Losing a Deff Dread to an immobilzation roll hurts, but you got to take it. I just wish they would not make you pay 10 points more; 5 points would have been acceptable. Killa Kan Attack Mob (Fast Attack): Killa Kanz are the same as in Codex: Orks, except they occupy a Fast Attack slot and can be taken in units of three to five. I must say, a unit of five Kanz is really nice! Mega Dread (Heavy): The Mega Dread is nice. His front and side armor of 13 and rear armor of 11, coupled with a 5+ invulnerable save really helps his survivability, but he will most likely be destroyed no matter what as your opponent will fear him and put him high up on the target priority list. It might be best to leave him in reserve whenever possible. Having a walking Kill Kannon is always nice, and fun, to have. Lifta Wagons (Heavy): Lifta wagons are battlewagons with a turret mounted Lifta Droppa. Most people say are expensive, and they are coming in at a base 225 points, but they will put the fear of god into your opponent. Being able to cause an automatic D6 Glancing hits on any vehicle within 48 inches is pretty powerful, and that is only the worst it can do when shooting the Lifta Droppa! Dropping the vehicle on another vehicle causes D3 Glancing hits to the second vehicle, or dropping it on an infantry unit will cause 2d6 Wounds to that unit (normal saves apply). Again this will be high on your opponent's target priority list, so it might be best if left in reserve. Also, I think I would reserve this for games that are 2500 or more. 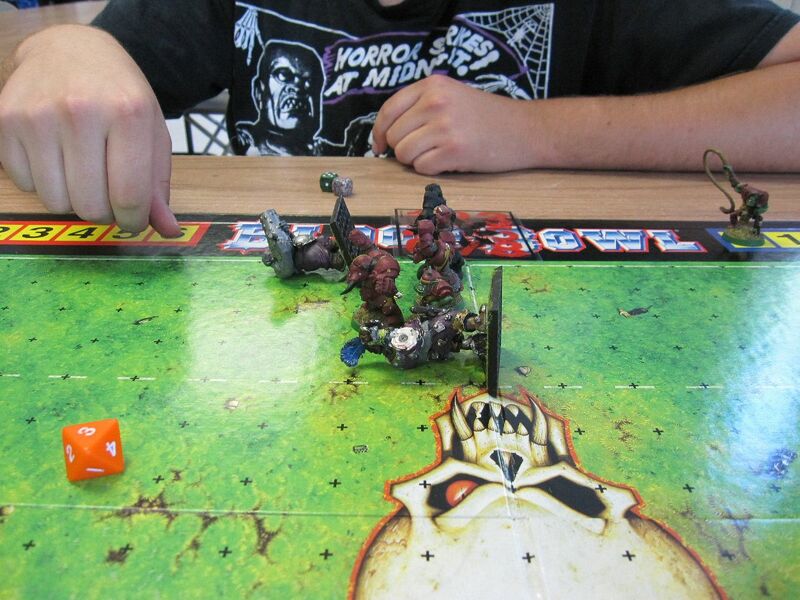 Lootas (Heavy): Lootas are exactly the same as in Codex: Orks except they occupy a Heavy Support slot instead of Elite. I am not sure how competitive this army will be in the long run, but overall the list was very fun to play and I look forward to getting more games in. 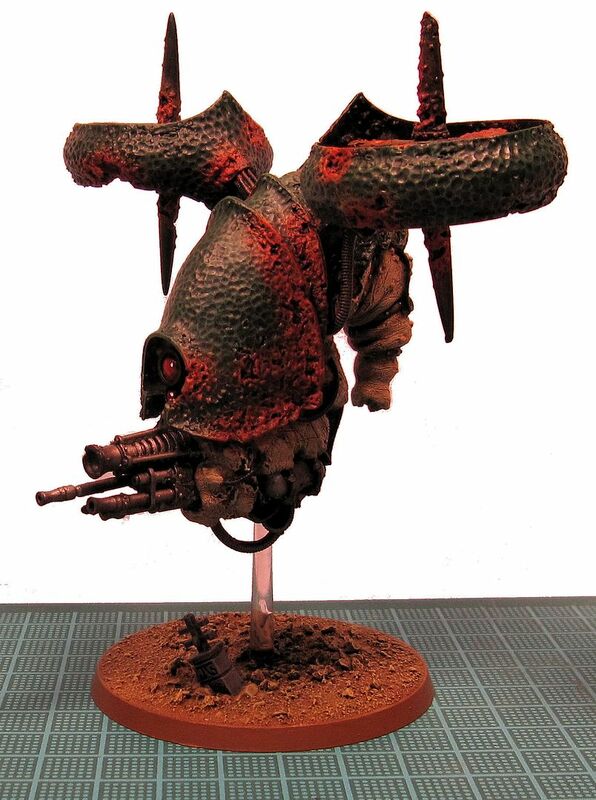 The other day, I picked up a Blight Drone from my FLGS for use in my Chaos Daemon army and I have been anxious to put it together. Even though I should be working on painting my Big Mek Stompa, I went ahead and put it together last night. 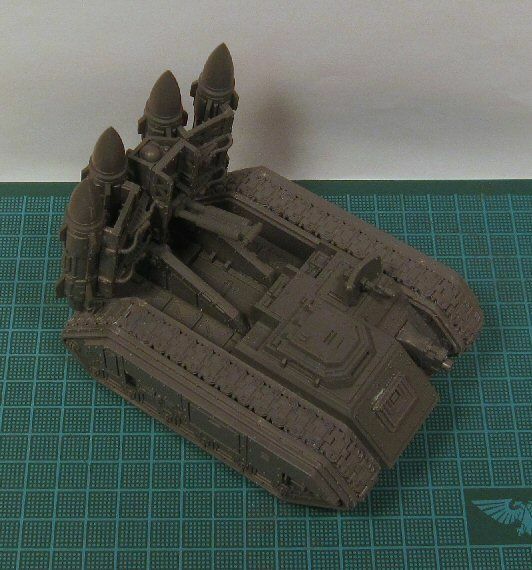 This is the second Forge World (FW) model I have purchased this year, the first being an Ork Mega Dread. Before that, it had been a long time since I bought any FW models. 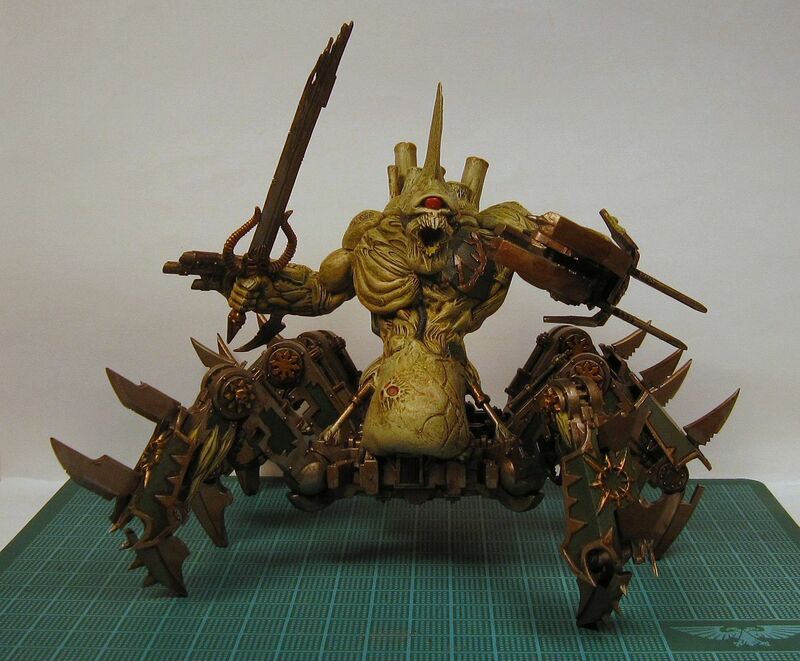 FW models used to be infamous for bad casts with really bad mold lines. I was impressed with both of these new models. 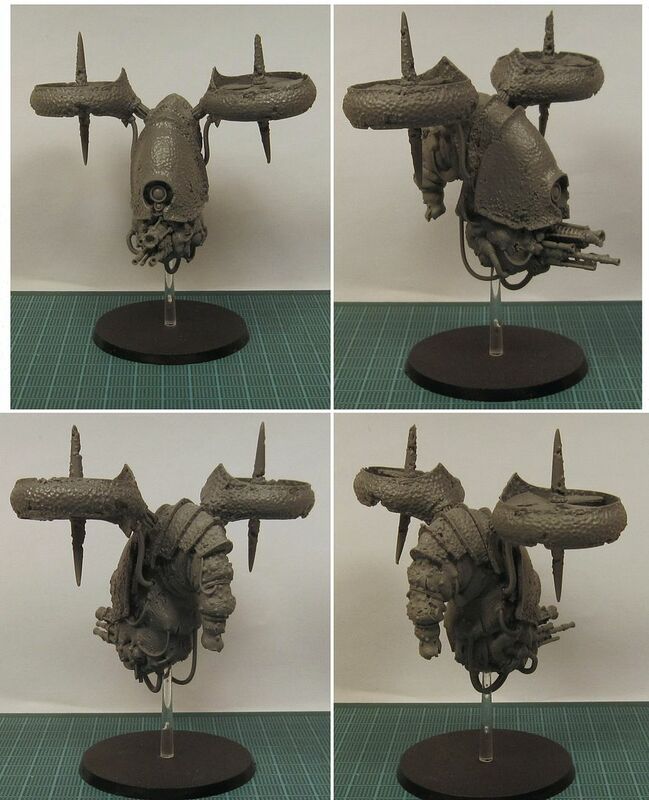 FW must have really improved on their casting process, there were just a few mold lines and they were not bad at all. 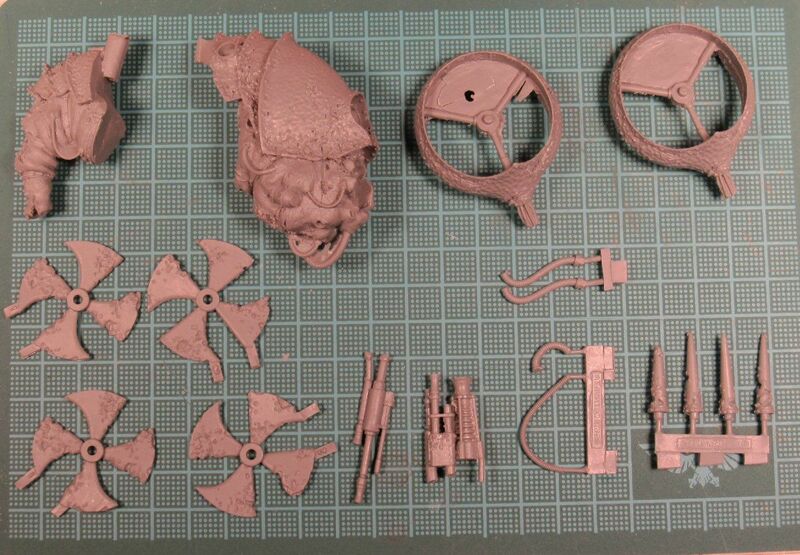 Here are the contents of the kit with the exception of the 60mm base and flying post. 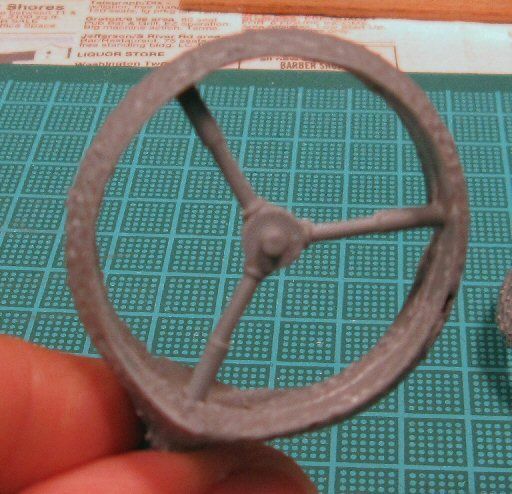 As you can see, not a lot of pieces so it should be quick to assemble. I was surprised to see that it came with four fans, I originally thought it would only have two. First thing I did before beginning assembly was to wash all the pieces throughly in warm water and dish soap and I used a soft bristle brush to scrub them thoroughly. This is to remove any releasing agent left on the model from the casting process. 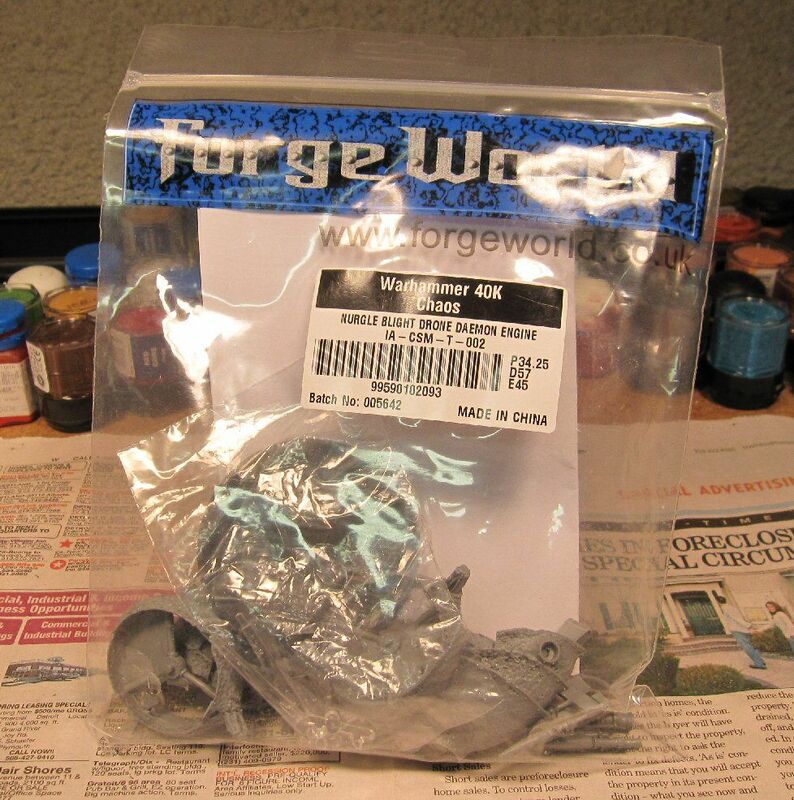 Although I have never experienced it, I have heard that the releasing agent can really cause problems when you try to prime and paint resin models, so you should always wash them thoroughly with warm soapy water. Then I set out to smooth out any mold lines and clean off any flash that there was. As I mentioned, this model was cast pretty well and had almost no mold line. Flash was not too bad except with the turbines. They had some really thick flash between the fan supports. I carefully used an Exacto knife to cut out the flash pieces and it took a bit of trimming and filing to clean up the pieces. After cleaning off the rest of the casting remnants, it went together pretty quickly. I made sure to pin the turbines to the body of the drone as I could see them easily getting knocked off. After just less than an hour of assembly time, it was built. Here it is fully assembled. 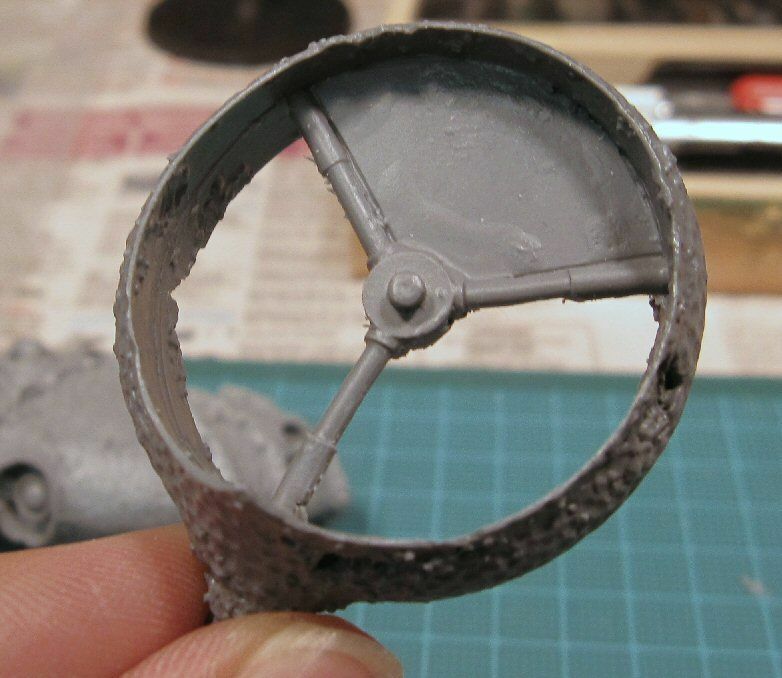 All I need to do is base it and it is ready for priming. 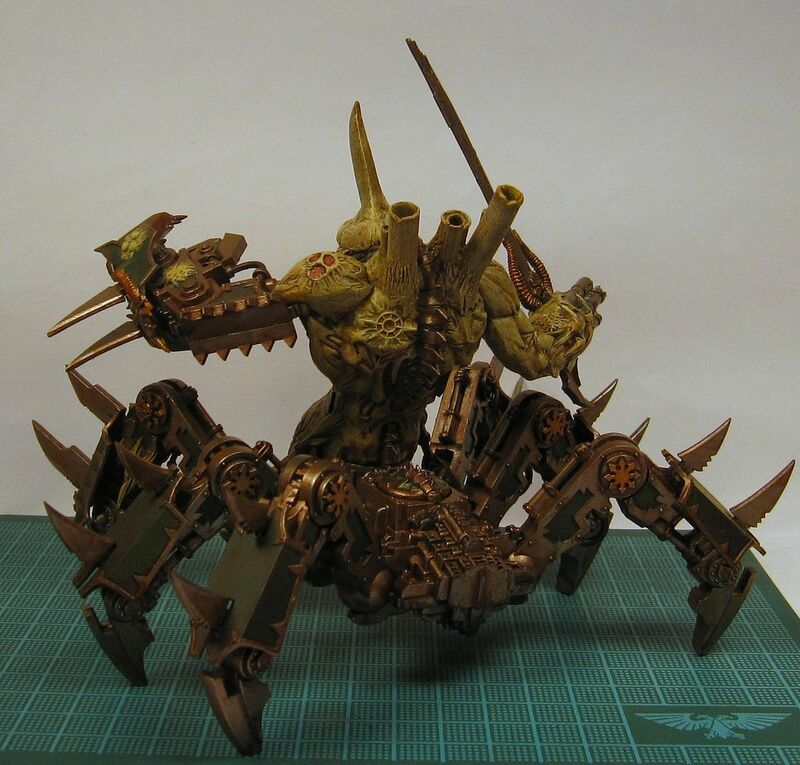 When I paint him, I plan to paint him in a similar way as I painted my custom Nurgle Soul Grinder (pictured below) that I did last year. 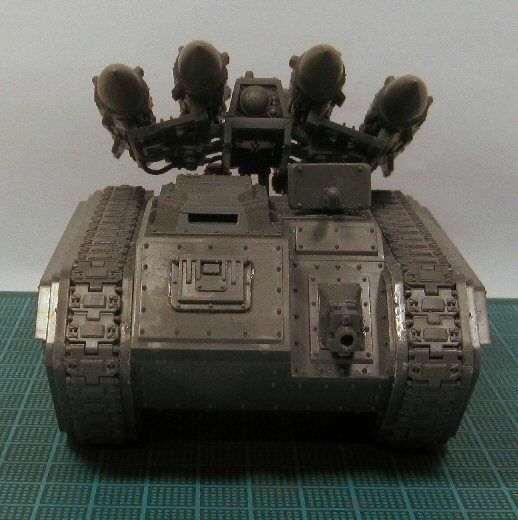 This Soul Grinder is the one conversion that I am most proud of and I can never pass up an opportunity to show it off. So if you have not seen it before, enjoy! It has been a while since I last posted, things have been busy and there has been lots of stuff going lately, both in real life and in the hobby. So lets get right to the hobby stuff. The 40kFC is running a club-wide campaign called The Galus Crusade. This campaign is actually the fifth part of a continuing storyline. Unfortunately, I was not involved in any of the first four parts, but I am excited about being a part of this one. The history of the campaign can be found here. Mekboss Grublug and his Dread Mob boys have allied with the Forces of Chaos. They attempted to make Planetfall onto Galus by assaulting an Elysian garrison outpost this last Tuesday. Keep watching here for the battle report which I hope to get posted within the next few days. Their next battle is planned for next Tuesday and should be against Ultramarines. 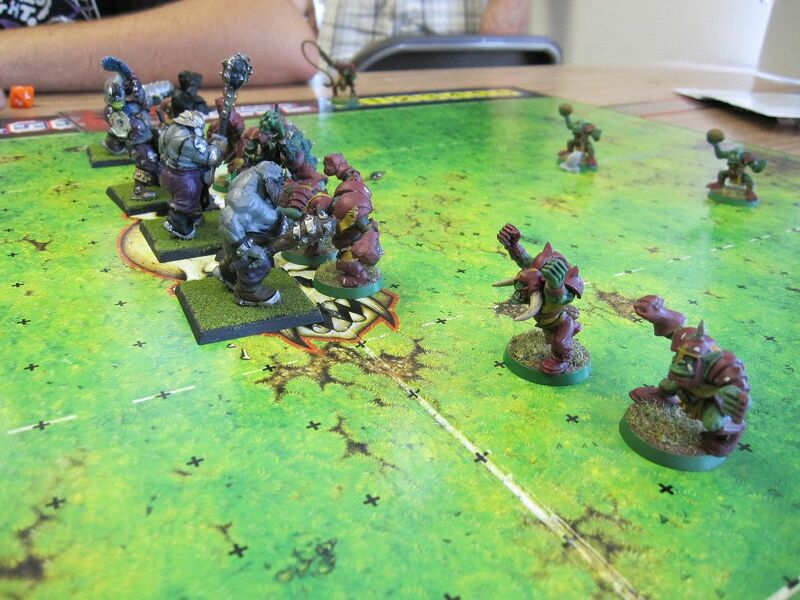 A week ago last Tuesday was Week 3, and the final game before playoffs, of the SEMBBL Spring Stompfest with which I am playing my orc team in. I will post a game report in a couple of days. 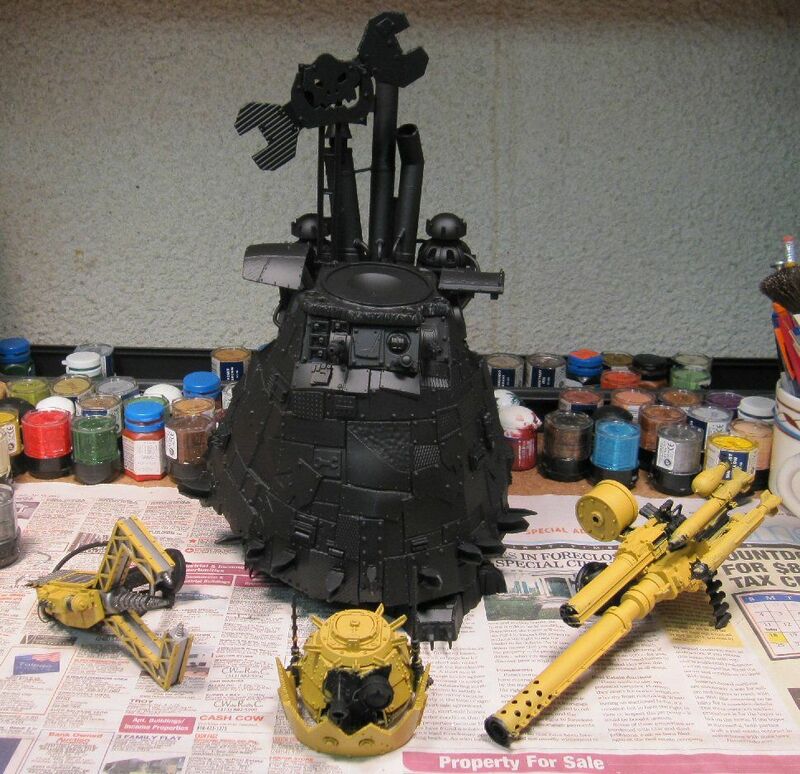 I am getting a late start on getting my Big Mek Stompa painted. It is all primed and I have begun painting the head and arms. Fortunately I still have two weeks to finish it and it should not be a problem to get it done in time. Here is a WIP pic. I stopped at my FLGS this afternoon to get some more primer and was surprised to see that they had this on the shelf and I just had to get it. I am excited about this model, it is one that I have been wanting for a while. 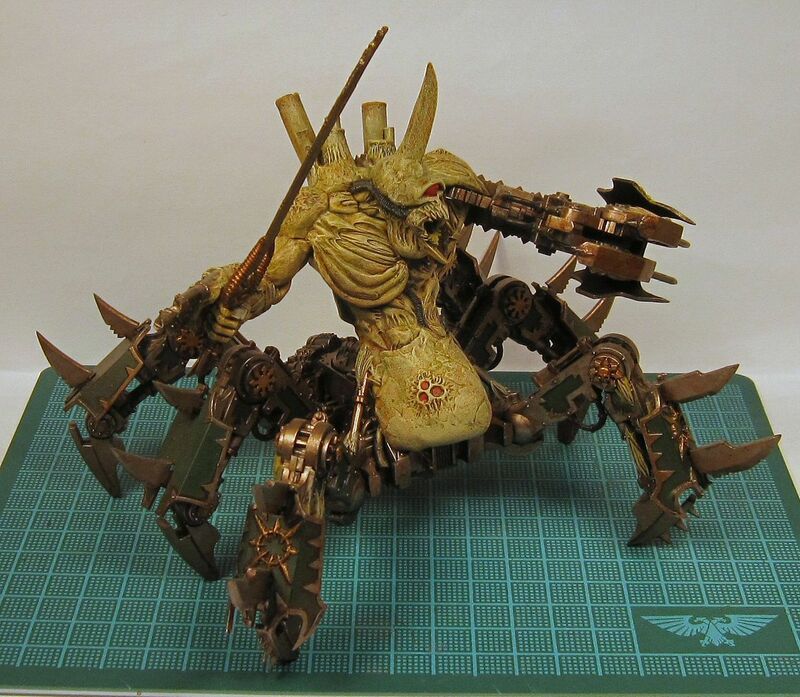 It is just the thing I need for my Nurgle Daemon army to give it some ranged firepower, although I question its long term survivability. I have got to get it built ASAP so that I can try it out. That is all for now. Time to get some hobby stuff done. The SEMBBL Spring Stompfest started last week. 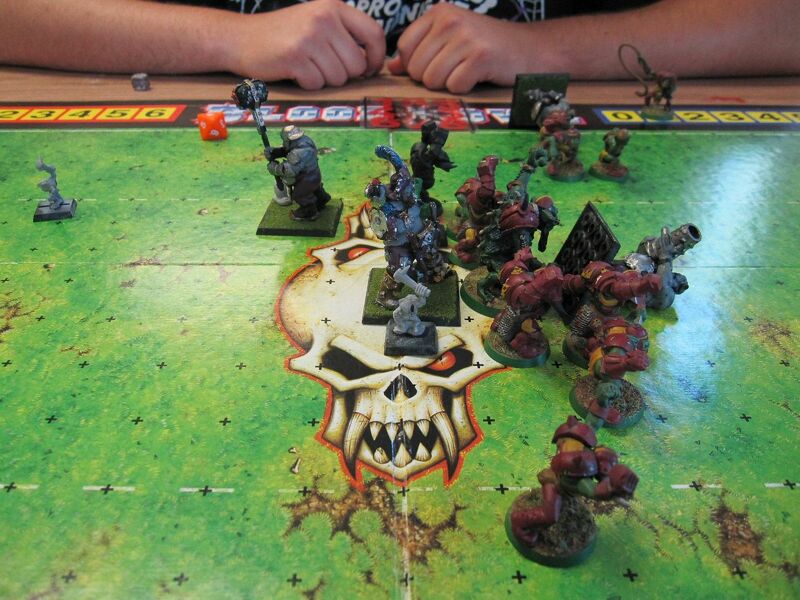 My Orc team, Morga's Mashas (or just 'da Mashas') is playing in this league. 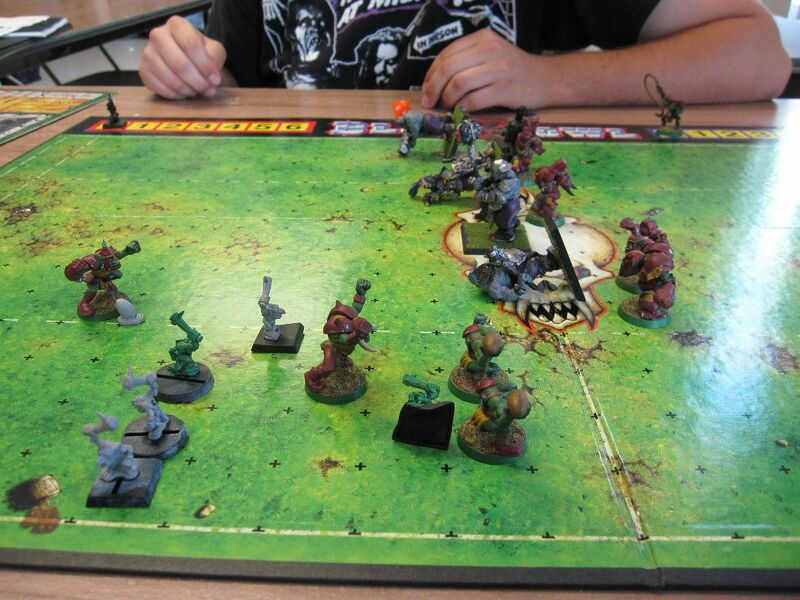 Last week was Game 1 against Wood Elves and the final score was a 0-0 tie. It was a very weird game where both teams came very close to scoring, but were denied by the dice. The Wood Elf Wardance had to dodge out of a tackle zone and would have been off to the endzone if it had not failed both its dodge roll and the re-roll. On the last turn, I had a blitzer in the endzone and a thrower tried passing the ball to score the winning touchdown, but it was not an acurate pass. 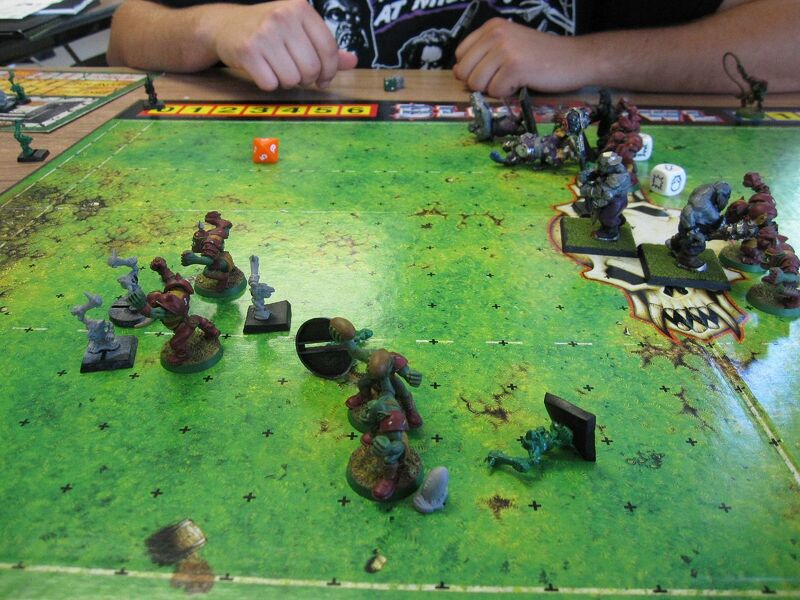 I did beat up my opponent's team pretty bad, even killed one of his linemen. My team came out uninjured and Bolgut the troll gained the Block skill. Game 2 was last night. 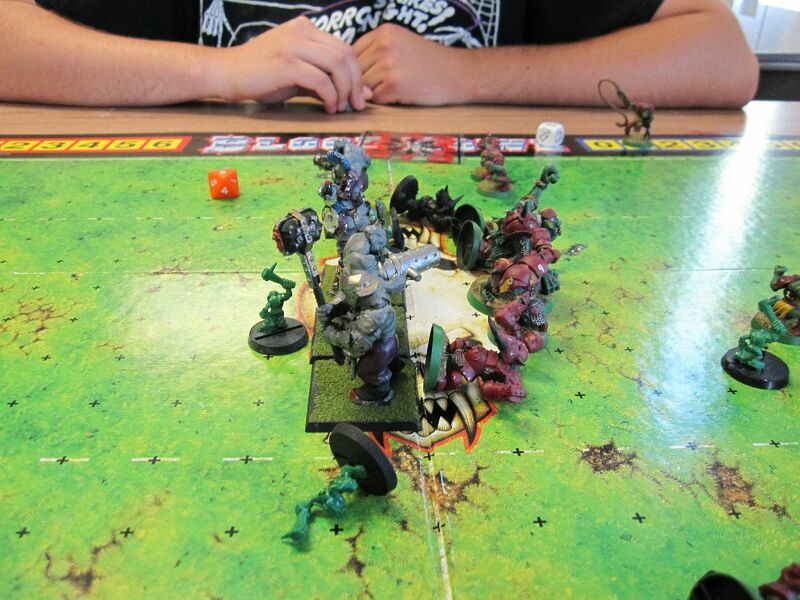 My opponent was ogres and I was not sure how to play against this team. It was a bit daunting facing so many 'large' creatures. 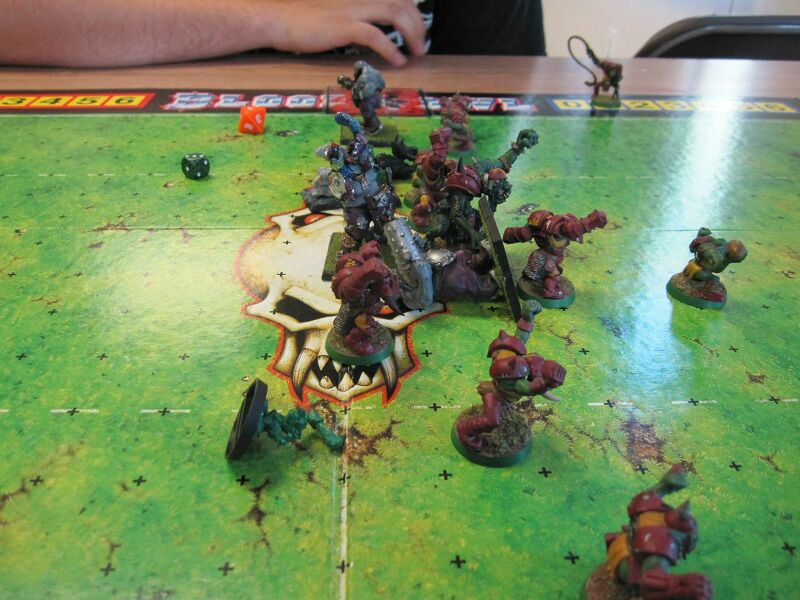 I learned during the match that if you take out the snotlings, the ogres are not so difficult to handle. The final score was 2-1 with da Mashas scoring the winning touchdown on turn 8 of the second half. Zagluk, a lineman, scored the winning TD which seemed to earn him MVP for the game and the Block skill. Kurzak, a blitzer, gained the Guard skill. Bolgut the troll was injured during the game and suffered a -1 AV, but fortunately his Regeneration kicked in and he was able to regenerate it. Other than that, my team came out with no permanent injuries. I feel fortunate for this. Unfortunately, I was too busy playing instead of taking notes but I did remember to take my camera this time. Here are some pictures. 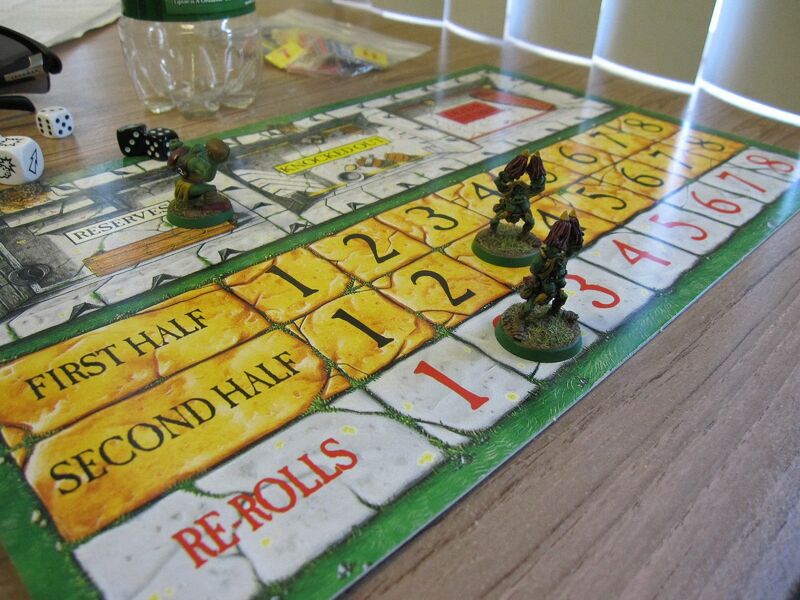 I found a great use for my Cheerleader models, turn and re-roll markers, and I used the coach model for the score marker. Looks like next weeks opponent is Chaos.